Few matters could be of greater urgency to a zombie than the unaccounted disappearance of a large number of brains. After all, this vital staple of the zombie diet is to die for! If you remember joining Detective Margh in Lu Muja's three-part thriller interactive comic tale expanded into interactive fiction, then it's probably a dead giveaway that you'll love this prequel adventure. Margh is sitting in his office when an older zombie comes in, looking to hire him for his services in regard to help with a robbery. You'll be asked to delve right in, taking down notes before your conversation with him even starts. If Sherlock Holmes were a zombie, he would be impressssssed! You will use these observations together to form "deaductions," small facts based on logic. From several deaductions, you then form the conclusion - in this case, that the stolen object's great value was not monetary, but instead purely sentimental. This is merely the beginning, and serves as a small aperitif to the larger framework of the game and the mystery. Along the way, you'll involuntarily acquire the zombie Ghvnn as a sidekick. Sometimes, conflicting facts will give more than one possible inference, and it's up to you to reason out which of them makes most sense. Lu Muja offers a charming story and plenty of text and characters to get wrapped into in this point and click. The prequel helps to provide character development and insight into the beloved three part game that follows, explaining where Margh reluctantly picked up Ghynn. 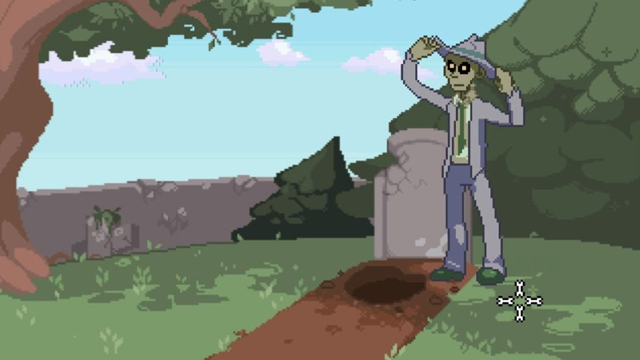 At some points it is possible to get weighed down or miss clues, but for the most part this game avoids the tedious pixel hunts, and the catchy, upbeat music will help you through. If you don't solve everything completely (and correctly) on your first playthrough, there is replay value to try and resolve the complete story to your satisfaction. 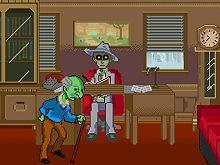 You will need all your brains in this marriage of point-and-click and detective thriller. Keep an eye on them, though, or they might inadvertently fall prey to Ghynn's insatiable appetite! In the first area, take the hat and leave to the right; After the short scene, talk to the paper boy and ask to buy a paper. He will ask you for money. Check your hat in the inventory. You'll find two gold coins (two neuros) hidden inside it. Give them to the paper boy and acquire the newspaper.Leave the area and go to your office.You'll meet your first client, try to impress him with your deductive skills! First, combine the clues "tip to ol'knock” and "hiring a detective”.Then, make your deductions and find the most plausible solution.Before leaving the office,inspect the second drawer and pick up the press pass.Now go to the restaurant.Inside the restaurant,speak to Mitsk and interrogate him. You’ll obtain two other clues. Go to the kitchen and meet Ghvnn.You can also interrogate the cook, Snjagr.Ask him about heleek's offer and you'll obtain the clue "snjagr knew nothing"Explore the kitchen. Open the fridge and you'll find the clue"fridge has been emptied".Observe the window,then the mark on the wall to obtain the clues "thief escaped through window” and "thief is agile” go back to mr. Mitsk. ask him about "snjagr knew nothing”.Now go back outside,ask the janitor about "snjagr respects mitsk".He'll tell you snjagr is a once famouse cook who lost everything, obtaining clue "snjagr likes the restaurant” Outside the restaurant, exit to the left. You’ll find yourself in the alley. Watch as the sewers manhole has been left opened. now go to the “drinking dead”.The informer will ask you three questions: answer, in order, with the second line, the first line and finally the third line.You'll obtain awk's phone number as well as a new deduction. Go back to your office, and call the number. Go back to the drinking dead, wait for awk to leave and then follow him. - You’ll be back at Mitsk’s restaurant. Now you have all the clues you need to formulate your theory and solve the case!